Last week, just before the meeting to decide the issue, I wrote about the plans for Clifford’s Tower. On Thursday I watched the webcast of the council meeting and in the evening wrote a bit about that. Since then, it’s ‘kicked off’, as they say. There’s a petition, a protest planned for the weekend, a lot of social media activity, reports in local media, and York Central MP Rachael Maskell has become involved. There’s a sudden outpouring of anger and outrage, and words like ‘desecration’ and ‘vandalism’ flying around. Some of the coverage has been interesting and enlightening, so I thought I’d link to interesting and enlightening things I’ve been reading and watching/listening to, on this subject. David Dunning at Minster FM has produced short videos (1-3 minutes), presenting the views of campaigners and talking to Cllr Ann Reid. A recent BBC Radio York interview with Rachael Maskell (MP) (3 mins approx) is also worth a listen. As is an interview with Jeremy Ashbee from English Heritage, from 28 Oct, explaining why the changes are thought to be necessary, and the process involved in getting to where we are now. It’s at about 9 mins 52 on this link. Part of Jonathan Cowap’s programme, followed by calls from listeners on this subject. These plans may have suddenly come to public attention but they are of course the result of several years of work. Residents’ views were requested earlier this year in a well-publicised consultation covered by local media. In January Stephen Lewis at the Press wrote an in-depth article with the attention-grabbing headline Make sure you have your say on the £2 million visitor centre proposals for Clifford’s Tower. This and other publicity resulted in what sounded like a good response to the public consultation, as reported in the Press: Model unveiled of proposed visitor centre for city monument. A lot of support, apparently, back then, or certainly quite a bit of interest. The comments on the articles in the Press seem to have been largely negative from back then, and at least one person was worried enough to want to start a petition at petition.parliament.uk, in January. A lot more interest now, when it’s a bit too late. Or is it? A lot more could be said, and no doubt will be. Perhaps on here even. I have something drafted, in a burst of enthusiasm/exasperation, but I think it might need some rephrasing. Enough inflammatory language out there already, methinks. A question … does anyone out there like it? Anyone excited about the proposed changes, or at least perhaps open-minded about them, interested in them? If you’re not appalled, disgusted, outraged, please add a comment. There’s a lot of interest in the site, but it’s a site with a long and complex history, which perhaps isn’t fully appreciated. Particularly interesting, and a recommended read: Introduction to York Castle Project. Understanding Clifford’s Tower & 1190 in Variety of Contexts, from History Works. Among the documents provided in support of the recent planning application, the Design and Access Statement (part 3) is recommended, for an insight into the other possible sites for the visitor centre, and its appearance, and how that has been developed/altered. It’s on this list, or may be directly accessible here as a PDF. @sosyorkicon on Twitter has details of the protest this weekend. 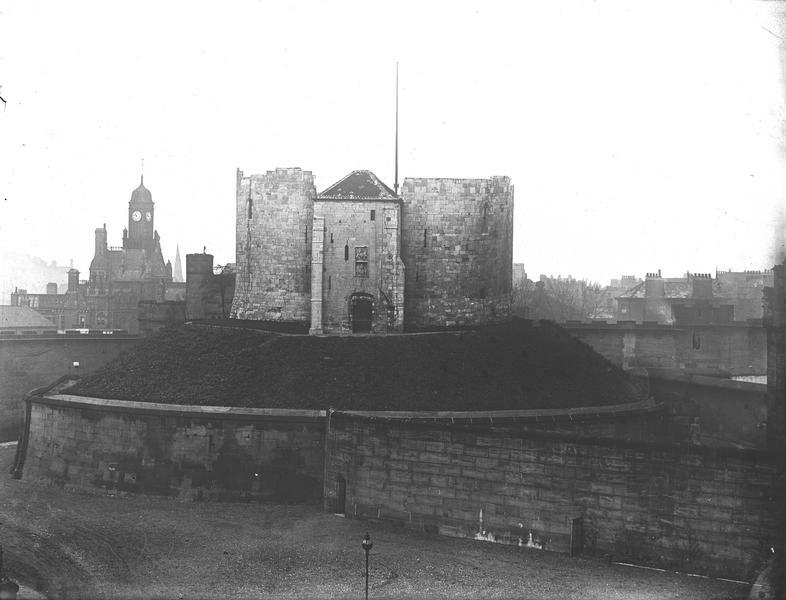 On this site, you may also be interested in other pages tagged Clifford’s Tower.